To watch the video from the Telus Facebook live stream, click here. 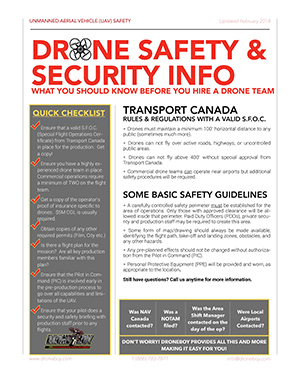 Due to the unusual nature of this job (drones in fireworks, drones flying to 1000’ AGL, multiple drones launching from a boat, drones flying right next to an active airport, multiple drones in the air at night etc.) the paperwork, permissions, clearances and communications side of this job was by far the biggest challenge of all. We had to get permission from the fireworks vendor, the event sponsor, and from the Toronto Port Authority who control the water off downtown. As this project was outside of the parameters of our current Standing S.F.O.C. (Special Flight Operations Certificate), we applied to Transport Canada for a one-time only Restricted S.F.O.C. giving us permission to fly to 1000’ AGL next to an active airport with the appropriate communications plan in place. We also had to get Toronto Island Airport (CYTZ) and NAV Canada to sign off on the project. Luckily DroneBoy has a long track record of successfully completing “unusual” aerial missions like this and we have a great relationship with all the local authorities, regulatory bodies and stakeholders, and thus we succeeded in getting all permissions in place. Now we would get to actually do the mission! Our team was well prepared as we had practiced with all the equipment during the weeks prior to the shoot at our location just outside Hamilton, Ontario. During the many run-throughs, we rehearsed our roles as a team, our communications plan and even our emergency procedures; the technology and the team worked in practice! On July 1st, during the day, we were a little bit concerned due to the gusting winds, but by dusk the winds calmed down to almost nothing, as they usually do, and we were good to go. 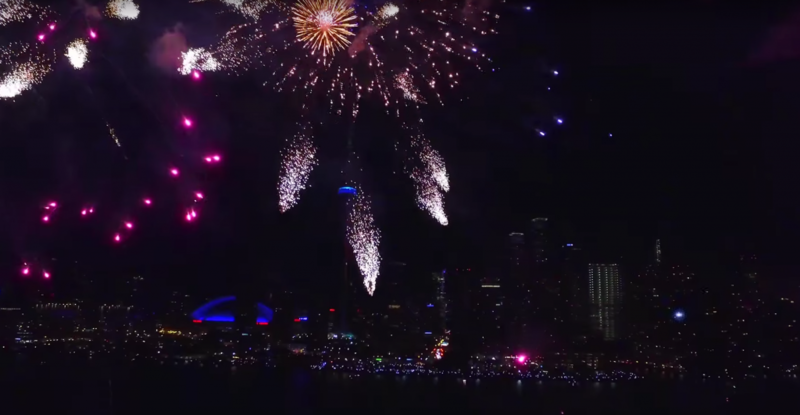 Prior to the fireworks show start, and the launching of the drones, there was a lot of communication back and forth between the Island Airport (CYTZ) tower, ourselves, and the fireworks lead shooter, due to the “dynamic nature” of the last flight landing at CYTZ. Obviously no drones or fireworks would launch until the last flight of the night was “wheels down” as the fireworks were on the water just off the final approach. Our shoot/launch time was pushed back to almost 11:00pm due to these late arrivals, but finally CYTZ tower gave us the all clear so both fireworks and drones were quickly launched skyward. During our rehearsals we had practiced as much as we could within the bounds of our current Standing S.F.O.C. 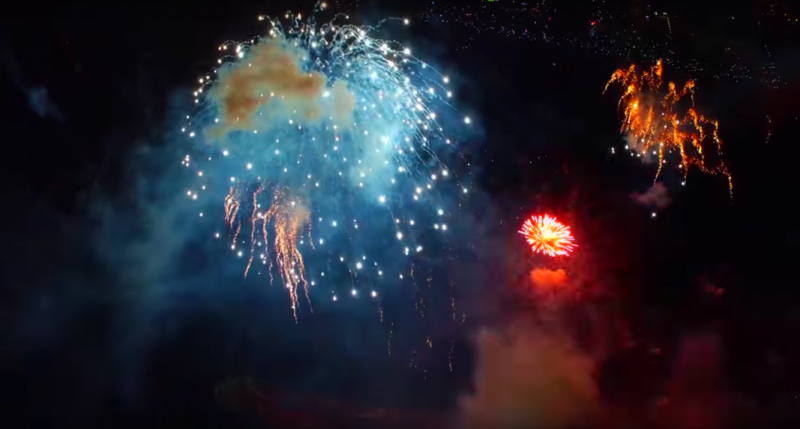 but due to logistics and legality we had not been able to practice all of it together until the actual show (Flights to 1000’ AGL, flights in a HUGE fireworks show, multiple drones launching from a boat etc.). As the show was 18 minutes long our plan was to start out at lower elevations, further out, and get progressively more brave with our shots (closer to fireworks, higher etc.) when and IF we felt comfortable. 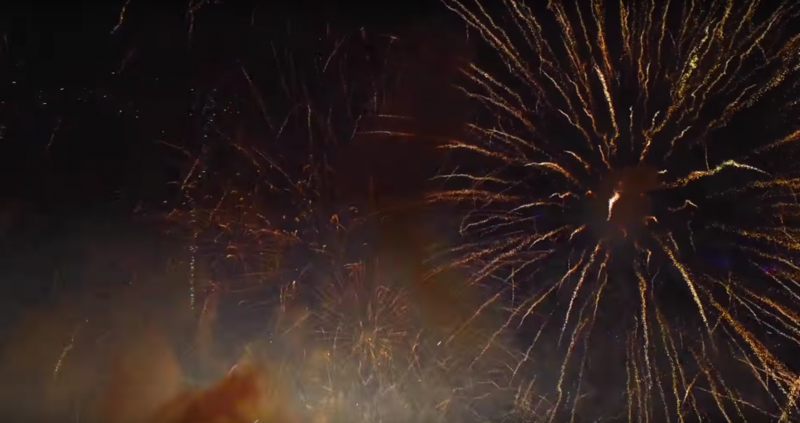 Right away we were surprised by how visible the drones were in the night sky adjacent to the fireworks. Our spotters had no problem maintaining VLOS (visual line of sight) at all times due to the added strobe lights, and the fact that the show was at night. Afterward we were told that the drones were visible even from shore. 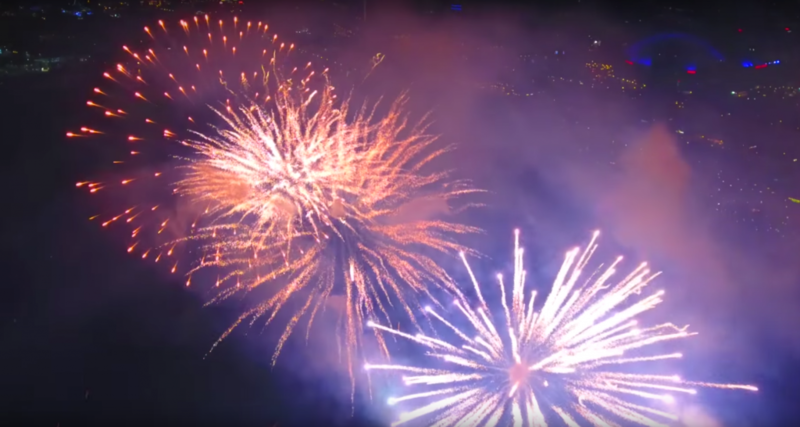 The live shots that we got from the drones were AMAZING and gave a whole new perspective to the fireworks show. The final live stream edit turned out far better than any of us had imagined it would, and our client was extremely pleased with the results. So far, close to 30,000 people have viewed and commented on the live stream. The live edit was seamless, and there were no interruptions in the transmission for technical reasons or due to us losing a camera feed. We are very happy with how this one turned out, and thankful to Telus for the opportunity, and to everyone who helped make it a reality. We are looking forward to our next drone live stream project! For more information on our Live Streaming services, click here.